Ink Volume: 16ml:Black, 10ml:Cyan, Magenta, Yellow. 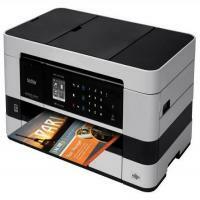 The ultra-resourceful Brother MFC J4410DW printer, a part of its Business Smart™ Series devices, stands out as a sophisticated all-in-one wireless printing device that boasts of umpteen advantages. It is not only compact and versatile but also economical and really easy to use. As for its abilities, it prints at a remarkable speed (up to 18ipm mono and 16ipm colour print) and even brings about automatic two-sided printing function and a 20 sheet automatic document feeder. The printing cost is not too high, due to its high capacity Brother MFC J4410DW Ink Cartridges that not only offers high page yield but has excellent ink quality with easy ink replacement options. It has a 1.8" Touchscreen display and a thoughtfully designed TouchPanel that doesn’t display unnecessary details as it shows only the keys you require. The Brother MFC J4410DW printer weighs 9.2 kg and has a resolution of 18.9" x 11.4" x 7.3". It facilitates an inclusive mobile device printing function wherein it offers wireless printing from a mobile device in conjunction with AirPrint, Google Brother iPrint&Scan, Wi-Fi Direct, Cortado Workplace and Cloud Print. It also supports wireless printing facilities which include easy to set-up wireless (802.11/b/g/n) along with Ethernet network. What’s more, the printer also connects you to commonly used web services directly from the TouchScreen LCD Display with which you can upload or download files to specific web services with the Internet-connected to Brother MFC J4410DW printer without a computer. Sites like Facebook™, Web Albums™, Picasa™ Flickr® and others can also be accessed through it. One of the highlights of the MFC J4410DW printer is the Landscape Print Technology, how it allows a paper to be stored and fed in the printer in landscape location and creates compact and sleek designs. The Brother MFC J4410DW printer is a pro at performing multiple printing tasks efficiently, though it needs to improve its ability to print in colour. The printer has excellent connectivity powers on different platforms, so printing from different devices becomes easier with it. What are the steps to be followed, if you’re facing difficulty with your Brother MFC J4410DW? The expiration date written on the cartridge package has passed. The ink cartridge has been in your machine for more than over six months. The cartridge may not have been stored correctly before use. Make sure you are using Brother’s High-quality ink. It is not recommend to use cartridges other than high-quality compatible Brother MFC J4410DW Ink Cartridges or the refilling of used cartridges with ink from other sources. Make sure you are using one of the recommended types of paper. The recommended environment for your machine is between 20 C to 33 C.
If there is no paper in a tray, load a new stack of paper in the paper tray. If the paper is already there in the paper tray, make sure that the printable side is facing up. If the paper is curled, straighten it and then feed the paper in a tray. Sometimes it is helpful to remove the paper, turn the stack over and put it back into the paper tray. Reduce the amount of paper in the paper tray or clean the paper pick-up rollers and then try printing again to check if the issue resolved. Q. Can I choose to buy 6 black Brother MFC J4410DW ink cartridges and 2 ink cartridges of every other colour in a multipack of 12 ink cartridges? A. Yes, you can choose your own combination of colours when buying multipacks. Multipacks are good for users who perform many print jobs and have high ink requirements. They are way cheaper than buying the ink cartridges individually. Q. How long would it take for a Brother MFC J4410DW printer to print 30 pages of a document? A. Brother MFC J4410DW printers can print up to 18 black and white pages per minute and 16 coloured pages per minute. Therefore, it would not take you more than 2 minutes to print 30 copies of a document. Q. What is the difference between original Brother MFC J4410DW ink cartridges and your compatible ink cartridges? A. Original ink cartridges are made from the same manufacturer as the printer. Whereas, compatible ink cartridges are made by third-party companies to work with your printer. The only difference is that our compatible ink cartridges are comparatively cheaper than the original ink cartridges even though they can produce the same quality output as the original ink cartridges. Q. Are Brother MFC J4410DW ink cartridges refillable? A. Yes, it is possible to refill Brother MFC J4410DW ink cartridges once they are empty. However, refilling an ink cartridge is a complicated and time-consuming procedure and can cause damage to the ink cartridge. It is recommended that you get the ink cartridge refilled by a professional. Q. How do I send a fax using the scanner glass? Place the document you wish to send with its face down on the scanner glass. Press the fax button and change fax sending settings according to your requirements by using the arrow keys to scroll through the settings. Enter the fax number you want to send the document to either by using the dial pad, the address book or your recent contacts. When the screen asks whether you want to send another page, select “No” if you do not wish to send more pages or select “Yes” to send more pages. Place the next page on the scanner glass and follow the same procedure. Press the stop button to stop faxing. Q. Do you offer different sizes of compatible Brother MFC J4410DW ink cartridges? What is the page yield of these ink cartridges? A. You can choose from different multipacks of these ink cartridges from four to 20 of them. Each of these cartridges prints up to 600 pages. Q. I’ve got a couple of multipacks of Brother MFC J4410DW ink cartridges which I plan to use at home. Since I won’t be printing too frequently, can I store the unpacked cartridges set for up to three months or so without any problem? A. These ink cartridges can be stored for up to six months in a pack. If you are confident that you will open the second pack after three months, there shouldn’t be any problem. Q. Are compatible ink cartridges more environment-friendly? A. Yes, compatible cartridges, whether they are ink cartridges or toner cartridges, are made from recycled cartridges that were used previously. That means there’s very little use of new components, and the previously used cartridge does not end up in a landfill or anywhere on being disposed after first use. Environmentally-conscious companies and individuals prefer compatible cartridges, which also helps them save more money as compared to the original ones and yet enjoy the same quality output. Q. If I place an order for Brother MFC J4410DW ink cartridges today, can I get them delivered the next day? A. If you place your order before 12 noon, your ink cartridges would get delivered the next day (subject to availability of the product and transportation conditions). We’d like to add that we do provide 1-2 days delivery services of the products. Q. Can the Brother MFC J4410DW printer be operated by a mobile device directly for printing? A. Yes, the Brother MFC J4410DW printer facilitates wireless printing from mobile devices that include AirPrint, Brother iPrint&Scan, Cortado Workplace Google Cloud Print and Wi-Fi Direct. Q. Do compatible Brother MFC J4410DW ink cartridges also have premium quality ink? Is its wireless facility easy to set up? A. Yes, compatible ink cartridges are also provided with premium quality ink, which enables them to produce best quality output. It has an easy to set-up wireless (802.11/b/g/n)and has an Ethernet network too. Q. Since the Brother MFC J4410DW printer is compact in size, is the number of features it claims to offer exaggerated and lesser in number? A. No, although this printer is compact, it is loaded with a large number of quality features, which is one of the highlights associated with it. As a Business Smart™ Series printer, it is regarded as one of the best in the markets with regards to its features as well as quality of output. Q. I recently purchased Brother MFC J4410DW ink cartridges from you but there seems to be a problem with them as they have failed. Can I expect a replacement for them? A. Yes, we will first try to resolve the issue through customer support, for which we’d request you to provide some details to us. In case it doesn’t help, we will replace the ink cartridges. Q. I have been using compatible Brother MFC J4410DW ink cartridges in different Brother printers. Why is the page yield of these ink cartridges different in different printer models? Or is there a problem with my printers? A. No, the number of pages that ink cartridges print, though approximately 600 pages, does vary with different printer models, and also with the kind of documents you print. For instance, pages having heavily pixelated graphics consume more ink in the print cycle due to which lesser number of pages are printed by it as compared to regular text documents.